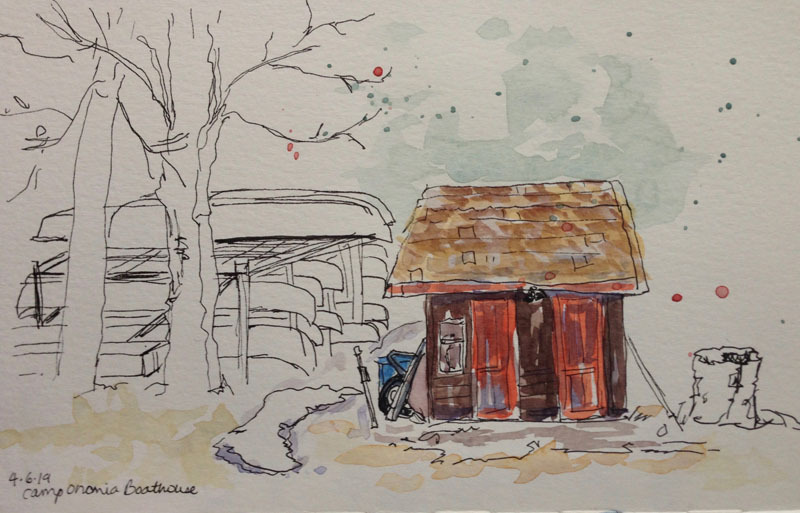 It’s not yet summer, but I sketched a picture of a small equipment house and canoes this past weekend. I was on a retreat at our church’s camp, and though the weather was cold and misty, I saw this small building across from my window. It was on the path to the lake and I noticed a bunch of canoes and boats on racks beside it. I liked its rustic elements— chopped stump and rusty wheelbarrow nearby. I shortened the building length a little so I had room for the stump. I tried to imagine it in the summer time when kids would be running past it, getting canoes, and traipsing down to the water’s edge. It looked kind of forlorn and unused sitting there in the mist and cold. I sketched the shed first, then started on the canoes, finally settling into the watercolors, all while standing and looking out the window. It’s funny what gets my attention and what I decide to sketch. And a shed in the woods got me this time! Previous Sketch Challenge— 100 people in 5 days!